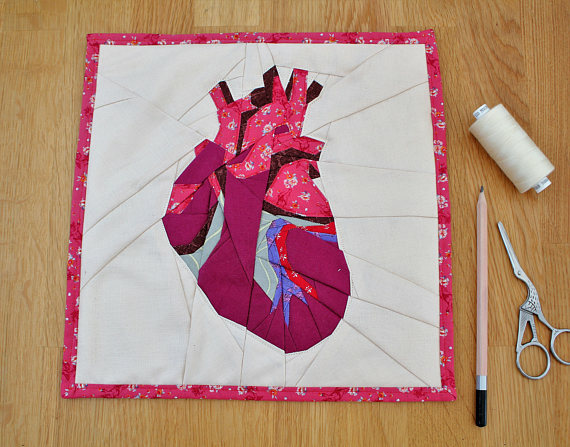 Whether you're a Valentine's Day lover or hater, this class is the one for you - a paper pieced anatomically correct heart! You'll learn all the skills of paper-piecing while making some fun home decor, just in time to celebrate the day of hearts. Pop it in an embroidery hoop or take the extra finishing class to make it into a tote, pillow, or wall hanging. However you use it, you'll be sure to be getting complements for years to come! Pattern and photo are by Etive and Co. Skill Level: Adventurous Beginner/Intermediate sewist (comfortable with the machine and have made some projects beyond Novice class).